Inventory We are a resale marketplace, not a box office or venue. Ticket prices may exceed face value. This site is not owned by Plaza Theater El Paso . The Plaza Theatre is one of the most historic landmarks in El Paso, Texas. 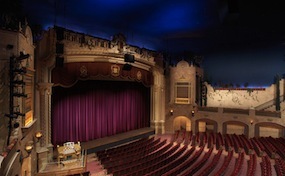 The Plaza Theater opened in 1930 as a film house with extravagant decor, grand size, and the most up to date technology. Between the 1974 and 1989 the Plaza Theatre was mostly closed for business. After years of public support the Plaza Theater was fully renovated by March 17 2006. The $38 million project restored all the luster of the building and brought the seating capacity down to 2,050. Plaza Theatre El Paso tickets are now mostly for popular traveling Broadway shows like Wicked, Jersey Boys, Les Miserables, and smaller concerts. TheaterElPaso.com is not affiliated with any official website, supplier, box office, or venue. We are independently owned and operated focusing on all online sales in the secondary ticket market. Prices may fluctuate above or below face value and tend to change quickly with demand. To order tickets to all Plaza Theater El Paso events simply click on the performance of interest or pick up the phone and call our operators at anytime.